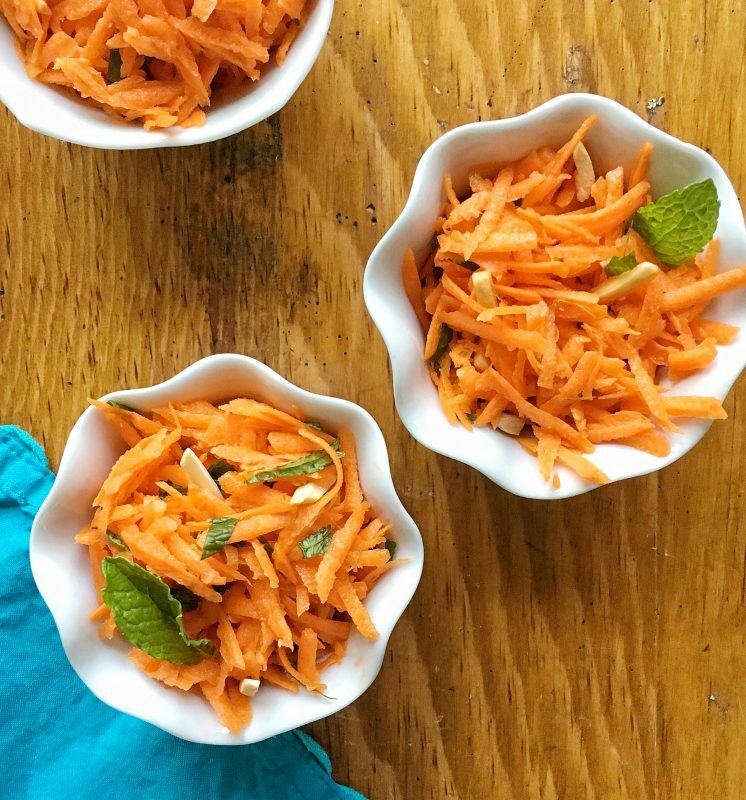 Crunchy shredded carrots combined with fresh mint, honey, lime zest, and lime juice come together quickly for this sensational side dish that’s easy to make and goes down the hatch without a hitch even if you have picky eaters at your table. While this recipe is definitely a bit more adventurous than baby carrots dipped in ranch dressing, if your kids are already carrot converts, I encourage you to make it. Think your kids don’t love vegetables? Try this recipe, compliments of ChopChop Magazine, the fun cooking magazine for families. And guess what? I just interviewed Sally Sampson, the founder of ChopChop about feeding picky eaters, and you can now listen to her tips and recipe ideas on Episode 3 of Liz’s Healthy Table! She’s also giving away a one-year subscription to the magazine (U.S. only). Click the play button above to listen to Episode 3 of Liz’s Healthy Table to discover secrets and strategies for feeding picky eaters. 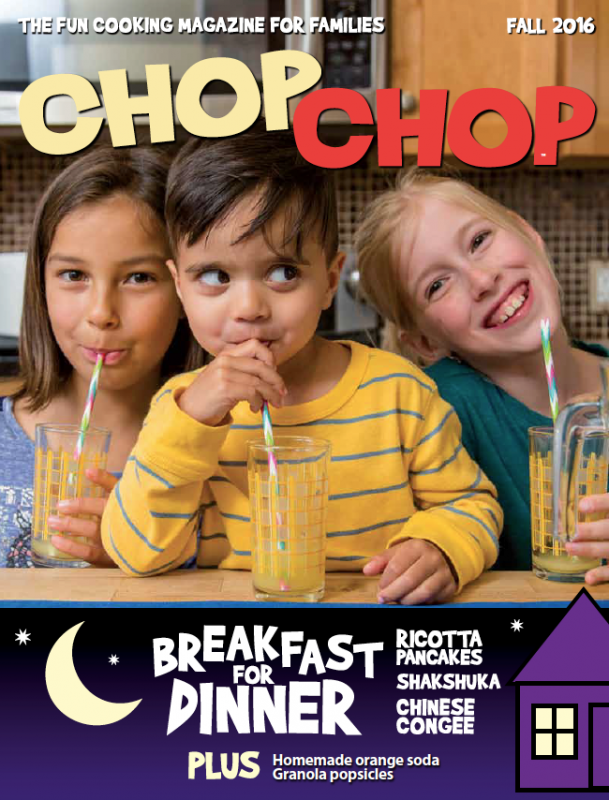 If you’re looking for a playful way to inspire and teach kids and families to cook real food together, check out ChopChop: The Fun Cooking Magazine for Families. Each ad-free issue is filled with beautiful photography, ethnically diverse, kid-tested recipes, kitchen how-to’s, fun food facts, engaging puzzles, and games to keep kids moving. ChopChop is available in English and Spanish. Sally tells me that this salad is like a cross between a slaw and a pickle and that it makes a nice, simple snack or side dish. I could not agree more! It's also great in a sandwich or taco or on burger. If you don't want to add peanuts, you can sub in walnuts or pecans instead or just leave them out. 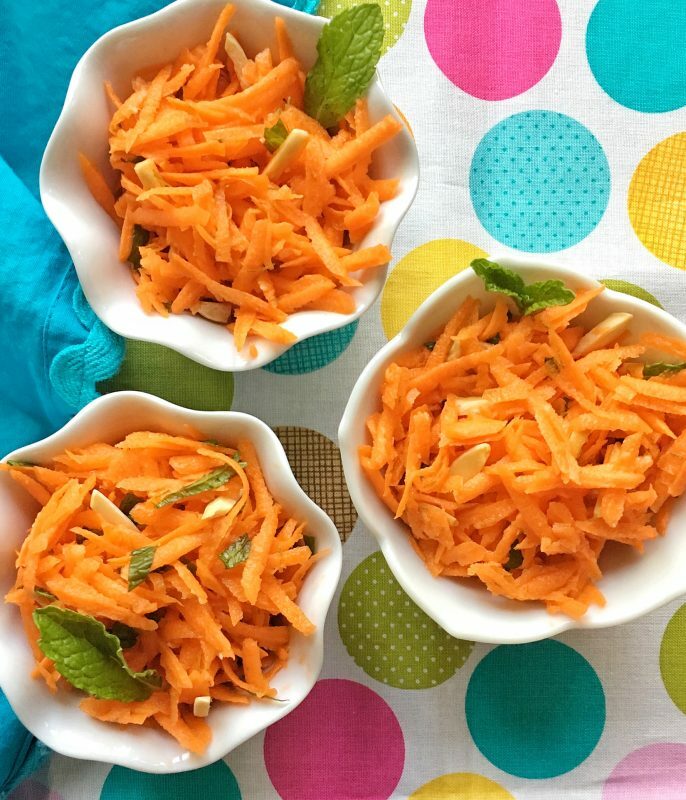 And if you happen to have picky or hesitant eaters at your table, the best way to get them excited about trying this carrot side dish is to have them help you make it. Kids can help by shredding the carrot, ripping mint leaves and tossing them in, or squeezing the juice from the lime. And then, of course, they can help you mix everything up. Grate the carrots on the large holes of the box grater. Stir in the lime juice and zest, honey, salt, mint, and peanuts. Taste the salad. Do you think it needs more lime? Mint? Honey? Salt? If so, add it, and taste again. Serve right away or store, covered in the refrigerator, up to 3 days. I’ve been a fan of ChopChop Magazine for years. You may have seen it in your doctor’s office or at the checkout lane at Whole Foods. If you don’t win the giveaway, you can subscribe to the magazine on the ChopChop site. And while you’re at it, peruse their site, because it’s packed with simple, fun and flavorful recipes (and nutritious, of course!) that kids can make on their own or with the help of an adult. Get your kids cooking, and then watch them try new foods happily. Amazing episode! I want to win a year subscription so that I can start my 3 littles + one on the way down the path to healthier eating and cooking for themselves. Cant wait to try out the carrot recipe! I will do both. I have four kids, two are picky, two are not. The way I make it work is that I cook foods separately. So pasta in one, veggies in one, protein in one. Then you can mix and match in the proportions that work for you. Two of my four kids are also aspiring chefs so they would love this magazine. Thanks so much for telling us about it! Love your site and your newsletter. I would love a subscription to the magazine. My kids are getting more and more interested in cooking but seem to be really picky eaters and I’m always looking for new ideas! I would love to win so I can find yummy and healthy recipes for my kids. I try to sneak in veggies in home made sauce (or shredded zucchini) or I do a lot of casseroles with veggies. I’d love to win a subscription to the magazine as I would like my son to learn how to cook. I’d like to teach my 22 year old how to cook! He never wanted to learn, though he does cook a mean omelet. Thanks for stopping by! I’d love to share the subscription with my sister-in-law’s family to encourage interest in cooking of their two under-five-years-old girls. As a dietitian, anything that promotes healthy eating as delicious and accessible is a win for me! Thanks for the opportunity! Our family does food trays with a bit if everything so littles can try lots of different items! This would be great for my daughter. She has recently become very interested in cooking. This would be something we could do together and she can learn at the same time. My best advice for getting picky eaters to eat is role model. When they see you enjoying new foods they will want to try it. My son was awfully picky and now eats foods such as eggplant Parmesan and Thai peanut noodles! My girls are getting really interested in cooking. We have been known to reenact episodes of Chopped Junior and Cupcake wars! My favorite tip for healthy eating is to serve fruits and vegetables raw at as many meals as possible. Putting out a plate of raw veggies while I am making dinner is a great way to get that started. I love that tip. It’s amazing what kids are willing to eat when you just put it out there. Good luck w/ the giveaway. My kids play “chopped” all the time and this book would be great to use as a guide for them. I would love to win the subscription as my boyfriend and are about to blend our families (his 4 and 5-year-olds and my 12 and 15-year-olds) and I’m looking to get them all involved in the cooking! Thanks for introducing me to ChopChop magazine. I have a picky eater, who is (very) slowly growing out of the phase, so in addition to this podcast, the magazine looks to be filled with good ideas for smart eating. One thing I like to do is serve raw veggies for my kids to munch on while I’m cooking dinner. It will! And be sure to tune in to the show and spread the word. So much great advice from Sally (and me)!! I would love to win this for my grandsons who are pretty picky eaters and this might help! My best advice for picky eaters is keep on trying. My sons were typical picky eaters, but we just kept serving healthy family fare over and over again, encouraging at least one “no-thank you” bite for every item we served. Now teenagers, I can serve them almost anything without complaint, and they are comfortable eating whatever is served them at friends’ homes or parties. What a fun recipe! I am about to be a Grandma for the first time. I want to be ready with fun, kid friendly recipes that I can make with the grandkids. Plus, I have friends whose kids are adventurous and I’d love to do more cooking with them. I’m going to check out the magazine! Congrats on almost becoming a grandmother. How exciting. I think my website and podcast (and this magazine) would be perfect for grandparents. Let’s spread the word!! My kids are super picky, maybe this magazine would inspire them to try more foods. Thanks for the great video. I meant thanks for the great podcast. I have one grandchild who wants nothing but dairy and another who wants nothing but fruit! That would be so helpful to get both of them in the kitchen. Thank you for the give-away! I know my daughter would love a subscription to this magazine! I would love to win a subscription to the magazine because you are an excellent source of nutritional information. Good eating starts when the kids are young. I found out about your site at the doctor’s office. I love watching the videos on making low calorie foods. I immediately shared it with my friends. I agree. It’s a superb magazine! Would love to win so I can help my niece learn to cook healthy meals. The best way I know to encourage kids to try foods is to include them in the process – from planning to execution. Keep your expectations of neatness low so YOU don’t get frustrated. Even if they don’t immediately latch onto new foods, cooking teaches many other skills. Whenever grandkids stay with us, they ask to make homemade buttermilk pancakes. They learned that pancakes don’t come from boxes in the freezer aisle, how great homemade ones taste and while measuring a bit of math and the science of watching for the bubbles to form and begin to break. I agree! Cooking with kids has so many benefits. How old are your grandkids? My 5 year old went from the toddler who ate everything to the preschooler who won’t touch anything, practically overnight! I need all the help I can get!! You’re not the first person to experience that! Tune in to the podcast — I guarantee you’ll hear some fresh ideas to get your preschooler back on track! I always try to stock our fridge with variety. I grew up on canned veggies and the cheapest produce we could buy which resulted in a lot of apples and bananas. I try to give my two boys fresh fruits and veggies and a variety of things so each meal is an adventure. I try to keep things new and exciting. Proud to say my two year old loves peppers and is a huge fan of pomegranate seeds. Great podcast! One of the ways we have helped our kids not be picky eaters, is we all eat the same meal; no special meals, and no eating in front of the TV. We also try different foods and change up mealtime with different menus; getting the kids in the kitchen has helped as well. You’ve got it all going on! Thanks for sharing and thanks for tuning in. If you’re enjoying the show, please feel free to post a review on itunes. The ore we can spread the word about the new podcast, the better! Always appreciated 🙂 Have a great day … and good luck w/ the giveaway. I love to cook and am always searching for recipes the whole family will eat. I offer the same foods many times. My daughter did not like salmon. After a year of offering a taste when we had it for dinner, she decided she likes it and now requests it every week. Would love to win a subscription to Chop Chop! I would love to win the magazine subscription! I feel like I’m cooking the foods he likes, but then all of a sudden those aren’t his favorites anymore! I’m struggling and dinner seems to be a fight. I’m desperate for ideas – when the cook is burnt out – it’s no fun for anyone. I would love to win Chop Chop for meal ideas for my family. My son is a picky eater the older he gets and I am always looking at different ways I can get him to eat healthier. I think variety is a good way to expose him to different foods. And Chop Chop will help me do that! My son is a picky eater, and both of my kids are eager to help me out in the kitchen. So far, they’ve made lots of dishes with my help, but my youngest has just expressed an interest in making a few things by herself. My son is 9, and my daughter is 7, and this would give us some great indoor and healthy activities for the upcoming summer vacation. I would love to win this subscription… I have a “ladies baking club” with my little girls and we’re always looking for something to create. What helps them try new things are partitioned plates… they get to pick their own grain, protein, vegetable and fruit from the fridge and put it in the correct place on their plate. And since they seem to prefer most of these items raw, it makes a really easy meal! I would love to win the magazine subscription because my 9 year old is interested in cooking, and I’d love to show him some healthy options that would interest him. As far as feeding picky kids, my strategy is to present foods to them often, so they are used to seeing them on their plates. I’m hoping this will help them to be adventurous eaters in the future! Thanks for the podcast – I’m enjoying it so far! My daughter’s the pickiest eater and started school last fall. The school lunch menu elicited a huge “yuck” from her all but 4 days the entire school year. I got her to eat balanced lunches by letting her choose her weekly lunch. On Saturdays, we’d plan her lunch and buy any groceries needed (she had to choose a protein, fruit, veggie, grain, and beverage) and on Sundays, I’d cook and pack everything up for the week with her help into small 1/4 and 1/2 c. containers. This save me so much stress in the morning, and had the added benefit of warding off all the “but I don’t like that”s and “I’m not hungry for that”s that fill our interactions. I love family friendly recipes and the magazine looks so fun and interesting for all ages. I would love to try it for a year! I would love to win the subscription to chop chop magazine because I have two children who hardly eat a thing and I am at my wits end! The magazine looks great and I’d love to get them cooking with me. Thank you! Indeed. The magazine would be a great fit for your family! Be sure to tune into my recent podcast episode on picky eating. It’s sure to help!! I need any and all help I can get. I have two picky eaters and feel they will just always be picky. I’ve given up trying to get them to try new things. They’re 8 and 5 years old and have awful eating habits. I’m sure it is all my fault because as a mom it’s always the moms fault right??? No! It’s not your fault, but I’m sure there are a few things you can do to turn your picky eaters into power eaters. One of the easiest things is to shop and cook w/ your kids. That was one of the tips Sally and I talked about on my podcast. Have you tuned in yet to Episode 3 of Liz’s Healthy Table? The player is embedded right here in this post. Good luck w/ the giveaway, and let me know what I can do to help you w/ your picky eaters!!! I would love ve to win a subscription! I have one picky eater and one not, so finding foids to make that will ecpand the palate of my picky child would definitely make meal planning simpler! Right now, I stock up on the few fruits he will eat, and I find a way to put a vegetable in everything else. Meatballs and zucchini, brownies with beans, pancakes with pumpkin, etc. Good luck with the giveaway and be sure to check out the recipes here on LHT and on ChopChop! And if you get a chance, tune into Episode 3 of Liz’s Healthy Table podcast as we dish about feeding picky eaters! Thanks for stopping by. I am inspired by all your tips and ideas! My almost one year old eats everything! However, I’d love to gift the subscription to my sister in law. She’s trying so hard to change the habits at her house and get her kids (4 &7) on a healthier track. I love that your sister in law is making the switch to a healthier diet for her family. Way to go! Good luck w/ the giveaway. I’ll be announcing the winner tomorrow. In the meantime, do suggest toy our sister in law that she tune in to Episode 3 of Liz’s Healthy Table. So many great tips from Sally for getting picky eaters excited to try new foods. “You get what you get and you don’t throw a fit.” I use this reponse to my kids when ever they whine about food (I wanted the red popsicle) or screen time or many other instances. It may sound mean spirited to someone who has not heard it before but as long as the situation is fair, my kids have learned that whining does not work to get their way. I used to say to my boys when they whined: “I don’t understand what you’re saying when you whine. Talk normally and I will be able to understand you.” Worked every time. Thanks for sharing! I love recipe magazines and cooking. Completely agree that having the kid help really increases their willingness to try a new food or recipe!